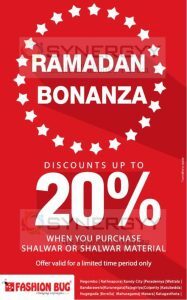 Are you aware this is a Ramadan Festive month; here is the celebration states with the Fashion Bug special promotion of save up to 20% when you purchase shalwar or shalwar materials in this festive month of Ramadan. Nike, Levi’s, Giordano Pepe Jeans branded clothing, foot wares and accessories are available at a unbeatable price tag of discount upto 50% in Colombo Sri Lanka. 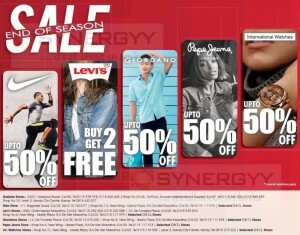 Wearing a branded jeans and shirts are always comfortable, here is a great offer from the Levi’s Stores in Sri Lanka, enjoy this unique offer and purchases your jeans and shirts at a special discounted price. It could be your dream of wearing international branded wrist watch to wear, this is a great opportunity for you to purchases your international branded watch at special 50% off only on international watch stores . 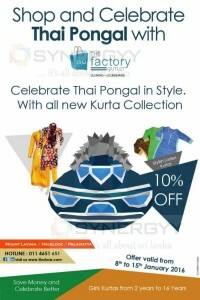 Let’s celebrate Thai Pongal festive with a new dress from The Factory outlet, the factory outlet offers you an attractive discount of 10% off on this festive shopping. 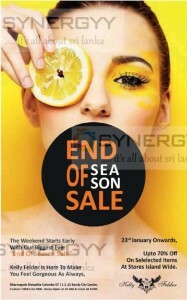 And the The factory outlet brought you all new Kurta Collection for girls and boys. This special promotion only available from 8th to 15th January 2016. 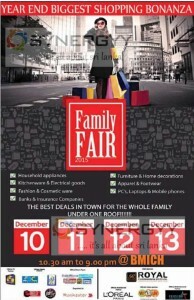 For more detail see below image or contact to The factory outlet at Mount lavinia, Havelock Town or Pelawatta. 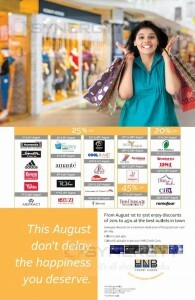 HNB offers discount from 20% to 45% for HNB Credit Cards from range of shopping outlets islandwide. Enjoy this offer only on this August from August 1st to 31st. Vonael announces a special promotion of 50% off for any of your clothing needs from sizes available from XS to XXXL for women. 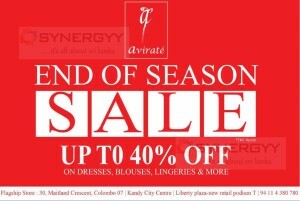 Avirate announces their end of season sale with discounts up to 40% off On Dresses, Blouses, Lingeries & More. Beverly Street announces a special 20% off for Sarees and Shalwars collection from 13th July to 18th July 2015. Visit and checkout at Beverly Street exotic collection of designer sarees & Shalwars in various shades, Patens and style and so much more in style and fashion. One stop shop for all latest fashion & Style for a good looking. 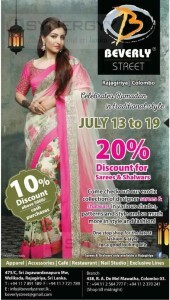 at Beverly Street Rajagiriya is only at Beverly Street showroom for Sarees & Shalwars, visit at Beverly Street Rajagiriya today and enjoy your shopping with 20% off. And all cash purchases over Rs. 5,000/- are entitle for 10% discount. 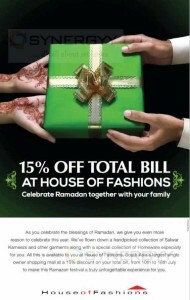 As you celebrate the blessings of Ramadan, House of fashion brought you even more reason to celebrate this year. House of fashion got flown down a handpicked collection of Salwar Kameezs and other garments along with a special collection of Homeware especially for you All this is available to you at House of Fashions, South Asia’s largest single owner shopping mall at a 15% discount on your total bill. The offer is valid from 10th to 18th July to make this Ramazan festival a truly unforgettable experience for you. 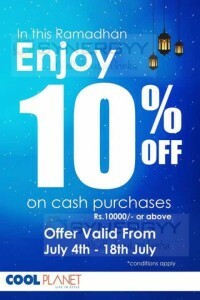 Cool Planet announces a special promotion for this Ramadan season, cash purchases of Rs.10000/- or above will get 10% off on all Item from 4th to 18th July 2015. Whatever your heart desires to make your dream reality, visit Kamsins, big in attitude, style and exotic splendor. 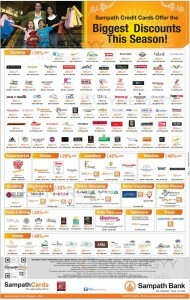 Choose from a breathtaking range well within your budget and make your Ramadan unforgettable one with discount upto 50%. 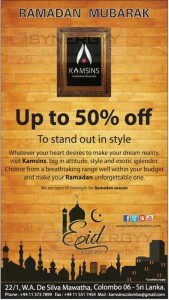 For your convince Kamsins open till midnight for this Ramadan festive season, visit today at 22/1, W.A. De Silva Mawatha, Colombo 06 – Sri Lanka. or contact on +94 11 573 7899. Sona Mandhir announced a special Ramadan Sale on this festive season, visit sona Mandhir and experience 40% off on ethnic ware of Kuritis, Salwar Bottoms, Lehengas, Salwar fabric and designer sareeries. 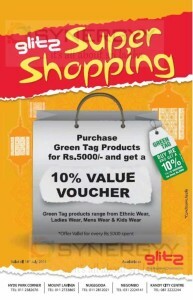 Giltz announces special promotion for this festive season, purchase green tag products for Rs.5000/- and get a 10% value voucher for free. 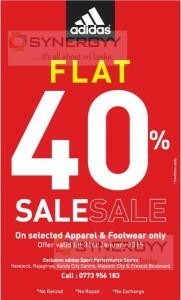 Romafour announces pre seasonal sale for Romafour high quality apparels, Inner Wear, Foot wear and accessories. The sale is open only on 13th to 22nd March 2015, visit today Romafour at 71, Galle Road, Colombo 04. Grasp your discounts. Avirate announces a special sale for this season of Buy 1 and get 30% off and buy 2 or more & get 50% off on selected goods. 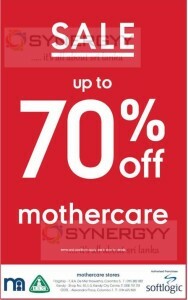 Softlogic subsidiary of Mothercare stores announces a special 70% off on selected items, the offers are valid on terms and conditions apply. Vonel introduce the fashion clothing for the Pregnancy period and be cool with your Pregnancy Curves. The Vonel announces a special deal of 20% discounts on all items and many new range of Pregnancy clothing arrived. 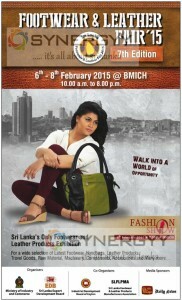 Ministry of Industry and Commerce and Sri Lanka Export Development Board have organized a Footwear & Leather Fair 2015 at BMICH from 6th to 8th February 2015. And a special fashion show also organized on 6th February 2015 at 7.00pm onwards. Avirate announces a special promotion for this end of seasons of 2015 new year, enjoy your shopping now and make it easy to your wallet. 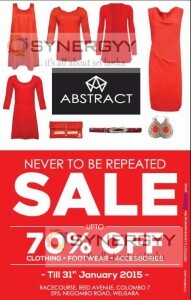 Abstract announces a special promotion of discounts upto 70% on Clothing, Footwear and Accessories available in Racecourse and Welisara branches. The special promotions are only valid till 31st January 2015. 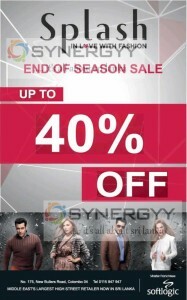 Splash a newly open a Softlogic branded apparel outlet located in New Bullers Roads announces a special promotion of end of seasonal sale discounts upto 40% for leading international branded clothing. *Offer valid on all locally issued HSBC Credit Cards. Terms and conditions apply. The Kelly Felder announces its end of season sale from 23rd January 2015 onwards. 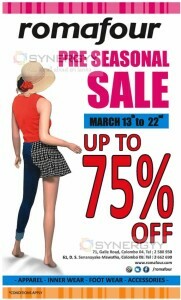 Visit to Kelly Felder and enjoy discounts upto 70% on selected items at stores island wide. 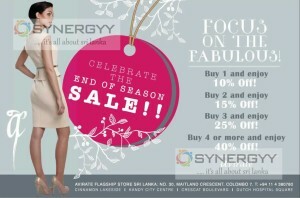 For more details see below image or visit to Kelly Felder at Dharmapala Mawatha Colombo 07 or L 3,25 Kandy City Centre. Mango leading clothing stores specialized in ladies wares and official & casual clothing for working women. 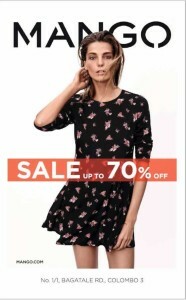 Now Mango offers a special off of 70% off on selected clothing. Visit today and enjoy your shopping at a best price. Adidas Sports and Performance stores in Sri Lanka announces a special flat 40% off sale on selected Apparel & Footwear only till 31st January 2015. Don’t miss this opportunities and grab your favorite sport branded clothing and shoes at an best price in Sri Lanka. 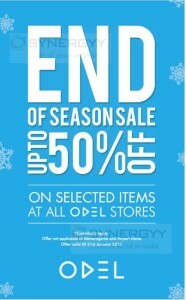 ODEL announces its end of seasonal sale promotions until 21st January 2015 and enjoy discounts upto 50% on selected items.